"We pledge to value and protect people, property, and the rights of all with respect, honor, courage and integrity." ​"Through community partnership and service, our focus is on citizen safety and trust. We will provide the highest level of public service for all through accountability, professionalism, dedication and effective leadership." ​Alternate side parking is allowed from 2 a.m. to 5 a.m. on all city streets, unless otherwise posted or exempt from the ordinance. On even numbers calendar days, all vehicles shall be parked on the even numbered side of the street. On odd numbered calendar days, all vehicles shall be parked on the odd numbered side of the street. In the event of a snow emergency, there is NO parking on any city streets for the duration of the snow emergency. The Wisconsin Rapids Police Department will collect your unwanted, unneeded or outdated prescriptions and over the counter medicines. Please bring all medication in a plastic baggie without the pill containers. The drop off location is located in the Lobby of City Hall just outside the Police Department. Our department will fingerprint individuals free of charge if you live or work with in Wisconsin Rapids city limits, otherwise we charge a $10.00 fee. We will provide this service as staffing allows and no appointment is necessary. Fingerprinting hours are 10 a.m. – 1 p.m., Tuesdays – Saturday. When entering the main doors of City Hall, pick up the red phone which connects you to dispatch and indicate that you need to be fingerprinted and an officer will be called in. Is my vehicle plate valid? You can check the status of your vehicles registration using the WI DOT website found here. 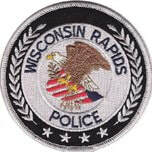 The Wisconsin Rapids Police Department will gladly host a tour of the department and its equipment for scouts, pre-schools, classes, and other interested folks. To arrange a tour please contact Officer Daven. We will ask about the size of the group and find a time that works for you and us.